Very nice, have they given you a permit yet? I haven't had a chance to fill out the application yet. I just got back from the Maumee State Forest office. My permit application is submitted. I am awaiting approval from the District Office. Per my conversation with Officer Philpot I have a few clarifications to questions that I asked. I asked if they required clear containers, since it is not specified in the guidelines. He said Ammo cans are not allowed, but plastic containers do NOT need to be clear. Geocaches do not need to be disabled or removed during hunting season. The forest does not close, to accommodate hunting. He said that hunting doesn't take priority over other activities in the forest. All activities are available all of the time, to everyone. Provided all guidelines are met for activities. He did suggest that seekers wear blaze orange, and use their heads. I asked about the number of caches that they plan to allow in Maumee State Forest. He said they would be happy to have one cache in each section of the forest. However, he did NOT say they would ONLY allow one cache per section. They are not going to have a preset number of caches allowed. If it looks like there are too many, they will have to draw the line somewhere. I forgot to ask about specifics on how many each person is allowed to hide on Maumee State Forest property. Good Dog has two caches already there, so I would say that if you want to place more than two, you should ask them the question before you spend any time researching or hiding any additional caches. 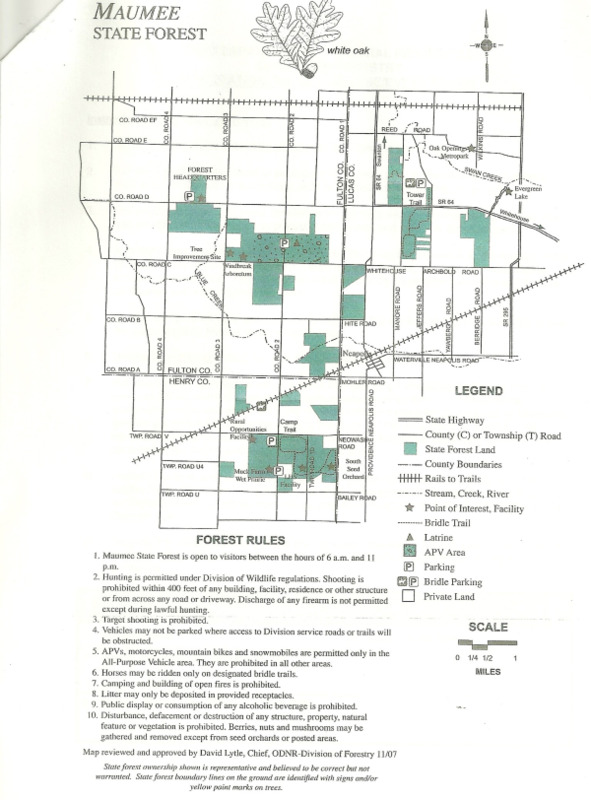 Attached is the official map of Maumee State Forest. There appear to be about 20 sections in the forest. I guess it depends on how they count them. Looks like basically the same paperwork I had to complete in 2003 for a cache in the MSF. The clarifications in the new policy are good, however they don't say ammo boxes are prohibited (unless they don't comply with the size requirement), so that must be a locally added thing. Had to smile on the minimum size requirement. Overall though, we can live with these rules. Hope somebody out there is planning a new tornado alley cache. I like the minimum size. I was reviewing this forum to see if you had any concerns or questions about the new Geocache policy for the state forests, and I see that you had some questions so I will try to answer some of them here. 1. It was mentioned that the policy does not mention the prohibition of ammo cans as caches, and you are correct. The policy does not mention ammo cans at all, and after reviewing the policy we will not prohibit them. That being said, it is your responsibility to ensure that the canisters are clearly marked as Geocache containers as per the policy. 2. Nighttime caches were also mentioned, and these are acceptable as long as they conclude before 11:00 PM. The use of reflective tacks however, is not permitted. These tacks can damage trees and becomes litter; they are removed by forest staff when we encounter them. 3. Cache density or caches per person also seems to be a topic of discussion here because the policy is vague on this issue. We are not specifically limiting the number of caches per section, but we would prefer to see them spread out over the different sections rather than a heavy concentration in any specific section. The same principle applies to the number of caches per person. At this time we are not limiting the number of caches per person, but would urge you to use your best judgment when applying for a permit. A select few people should not be the only ones allowed to place caches on the state forest. These decisions have been left up to the local management, so other state forests may operate differently. Any additional questions may be answered here, or if you want a more immediate answer please contact the Maumee State Forest at (419) 822-3052 with your questions or concerns. First I would like to thankyou for joining and assisting us with your current policy regarding geocaching. Secondly, I would like to know if you also control Fulton Pond, or could possibly point me in the correct direction of who's jurisdiction that would be. Officer Philpot, thanks for stopping by. We are happy to see that geoccahes will again be allowed in the Maumee State Forest. I have a questiion regarding vehicle parking. There are, of course, designated parking areas in a few areas of the forest. However, in most smaller areas there is not specific designated parking. Those areas generally have service roads. Is parking allowed at the entrance to those service roads as long as they are not blocked? Or is parking off the side of the roads adjacent to Forest land allowed. I received the permit in the mail today. The new cache listing is submitted, and awaiting publication. Fulton Pond is operated by the Division of Wildlife, so any questions about Geocaching there need to be directed to the district office in Findlay at (419) 424-5000. As far as parking on forest sections goes, please do not block the gates at all. We use them to access the sections for maintenance and emergencies. You should be parking off the roadway, but adjacent to the road, along Maumee State Forest property if you are in a section that does not offer a parking lot/area. To those of you who do not have vehicles that can safely park off the roadside, I would urge you to stick to sections that offer a parking area. Got a call today from Mr. Schmenk, said our request has been received, looked over, and sent in to the HQ. Said should have a permit in a week or two.